I am totally psyched to be sharing todays wedding with you! I don’t care what you are doing, you simply must drop everything and check this out, trust me you won’t be sorry! 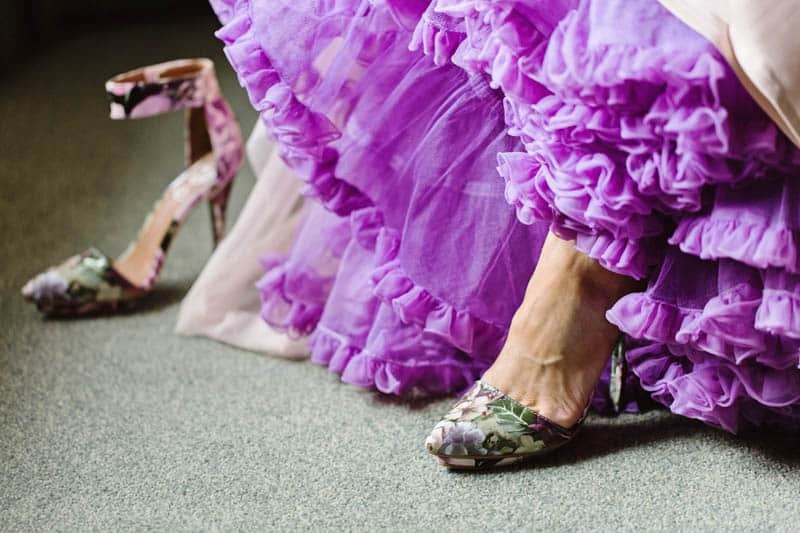 First the bride, Lauren, is wearing the most epic purple petticoat, which can you believe was worn by her grandmother many years before. As if that wasn’t enough the DIY details are phenomenal, especially the multicoloured cake that was baked by none other than the bride’s aunt and last but certainly not least I would like you to take a guess at what theme tune this bride decided to walk down the aisle too (Hint: Another install of this prehistoric release will be hitting your screens in May!). When you have finished I want you read through and marvel at Laurens creativity and her best friends talents. We wanted to keep the wedding below $10,000 and when all was said and done we hit it about right on the head. We would not have been able to do a 160+ wedding on that budget without the help and talents of family and friends. So we asked our best friend Beau to be our officiant, whilst his wife Brittany, helped me coordinate the bridal party day of, and gave a lot of time and creativity to help decorate our reception. Beau was not actually ordained, but my father was, so the night before the rehearsal dinner, when Jon’s family arrived we had a tiny little ceremony in the lobby of the hotel by the fireplace. The guests included my dad, my mom, Jon’s mom and dad and one Bellhop. He prepared a beautiful reading and we felt really blessed. My aunt made our cakes for us, they were delicious and beautiful! She is a little more conservative with her cakes but she really knocked it out of the park with my wild ideas. My cousin did all of our flowers for us including my crown! She is so talented and I just gave her a few reference photos of shapes I liked. I knew this was a great way to save money because I didn’t have any particular flowers in mind; I just wanted them to look a little wild. Two days before the wedding we went to Trader Joes and bought all of the flowers, we supplemented a bit of greenery from a floral shop. Jon and I bought huge rolls of butcher paper from U-Line and painted a runner down the middle with a roller. We also upcycled all of our vases and painted them gold or glitter. My friend did my wedding hair as a gift and Jon’s sister did my makeup. My best friend played the music for the processional and recessional. She is a professional violinist and her husband, Ryan is a composer. I really had to convince them that my dream music was acceptable to play at a wedding, so I drove to Lawrence, Kansas where they live to do just that. I only had one song that I wanted, and that was the Jurassic Park theme. I have a strong relationship with this song! It is beautiful, but if you catch what it is, it’s funny too. She was not too sold on the idea and didn’t think the timing would work, but I brought with me a box of wine that we would proceed to drink and she started coming around to the idea. By the end of the night it was clearly the best song for a processional and recessional in the history of weddings. Ryan composed the song for a two piece accompanied by keys, that our friend played so I got to walk down the aisle to my jam! This was by far one of my favourite moments of the ceremony! My dress was a Monique Lhuillier Bridesmaid’s dress that I ordered from Nordstrom online. I was having terrible luck at Bridal Shops and I was starting to run out of time. Each place I went put the pressure on and said I’d have to order that day for it to arrive in time but nothing was right. Every dress felt the same to me, typical, overpriced, too much material, too much to alter, and too much pressure. I just started ordering dresses from Neiman Marcus and Nordstrom and would try them on at home. When mine arrived, I tried it on with my mom and we knew it was going to work. It fit perfectly except for the length so my friend Brittany and I literally cut the bottom of the dress off with scissors! Not bad for a $400 dress. My favourite detail of the dress was completely unplanned until one day I had the idea while trying to think of my “something old”. The purple petticoat that we snapped in was my grandmother’s that passed away while I was in middle school. Her and my grandpa were amazing square dancers and my cousins and I used to play dress up in her outfits. That was really important to have something of hers with me on that day and made everyone remember her in a playful way. She was the ultimate in fun. Another of my favourite moments had to be a moment between the ceremony and reception we were done taking photos and I wanted a coffee so we stopped at a place nearby. It had just closed so we were sadly walking back to our cars when suddenly an old fashioned hot rod pulled up. The old man got out and offered us to take some photos with it. Just then, a woman who owned an antique store walked out with a vintage fur stole that was probably 9 feet long and said, “Honey, this is just what you need!” I think our wonderful photographers think we had struck gold! Everything was pretty magical that day. They were my favourite photos from the day!